Could the Summary Care Record survive NHS budget cuts? A recent Freedom of Information request Pulse made to Connecting for Health has given us a lot of answers about the Summary Care Record project – not least, a definitive list of the areas where it is taking place, a list Connecting for Health had up until now bafflingly refused to release. But it also posed a question. Given the constant criticism the Summary Care Record project has faced, and given that both main opposition parties - parties now in government - had pledged to scrap the national rollout, why did NHS East Riding of Yorkshire decide it was a good idea to start sending out letters to patients inviting them to take part just one day before election day? It's hard to believe, but it's true. The PCT is listed in Connecting for Health's response as having begun its public information programme on 5 May 2010, making it the 113th trust in England to do so. And while NHS East Riding of Yorkshire's bizarre timing may be an extreme case, it's indicative of the huge pressure PCT managers have been under over the past few months to hurry up and get on with it. The recent acceleration of the project took place with one goal in mind - to achieve a critical mass for the project and prevent it being scrapped. Once it became clear the project had no future under the Tories, one might have expect it to be put on the back burner, pending the decision of a new government. But in fact, they've been going hell for leather. Last November, the Department of Health decided to ditch trialling the rollout at selected GP practices which had bought into the programme, in favour of a mass rollout with whole SHAs sending information packs to millions of patients at a time. Then in December, Connecting for Health agreed to pick up the bill for information packs sent to patients in a bid to persuade cash-strapped NHS trusts to push ahead with the project – the latest FOI request reveals £7.5 million has been spent already. And even after the Government ordered the uploading of care record to be suspended in areas where the rollout had been accelerated, after the BMA successfully argued there had been insufficient patient consultation, some trusts apparently decided to carry on anyway. Has all this been enough to establish a critical mass which will keep the Summary Care Record safe in the forthcoming round of budget cuts? 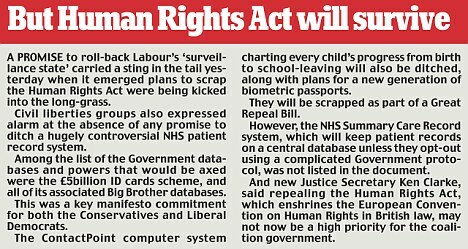 Well, today's Daily Mail highlights the fact that no explicit commitment to scrap care records is included in the coalition Government's Great Repeal Bill, liekly to be unveiled in the Queen's Speech later this month. Then again, budget cuts will be paramount in the coming months, and NHS IT is always an easy target. Populist, money-saving manifesto pledges are not lightly abandoned by a newly-installed government. What is certain though is that if the rollout had been launched in 2007 with the same urgency it's been completed in 2010 – right up to the day before election day – it might be a very different story.